Sewing has taken over a bit recently as I have lots of projects in my head. In fact, I have had to start a hobby notebook which so far has sewing project ideas, wish lists of plants and wish lists of more crafting goodies. 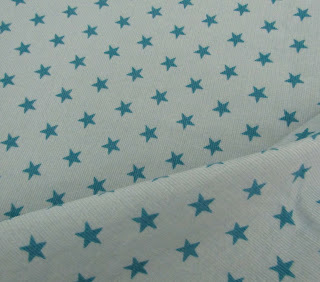 However, I am gradually making progress on the sewing list front. 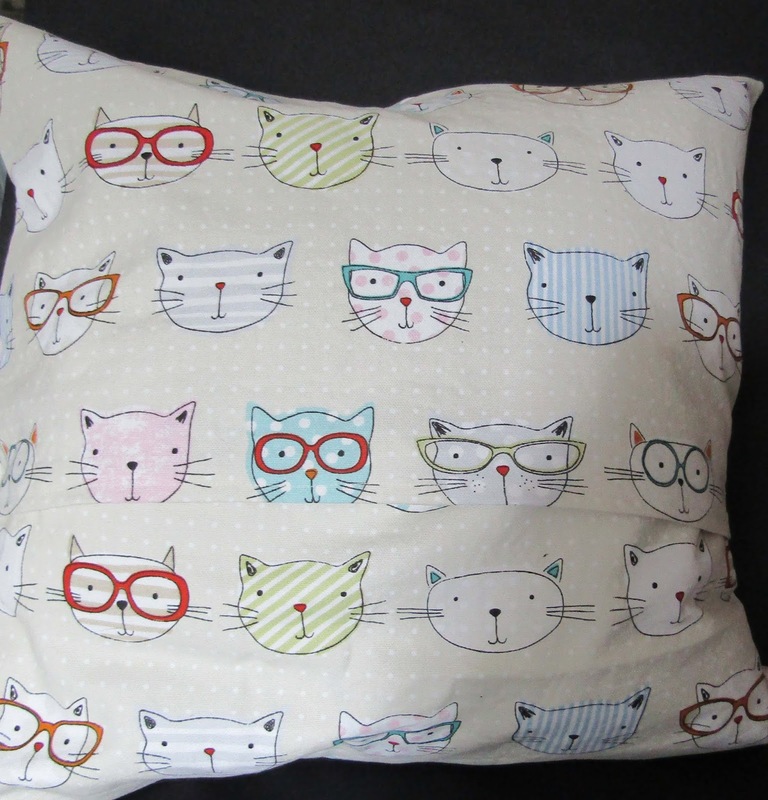 I have finally finished my cat cushion cover which has turned out just as I'd hoped. The centre panel is a screen print onto calico, surrounded by a cat print material which I love as it makes me smile. The back is a simple envelope but shows off the fabric nicely. This tunic dress has featured on my blog several times and I am finally happy with it and actually wearing it now. It was too short originally and I made it with puffed sleeves which weren't very comfortable. 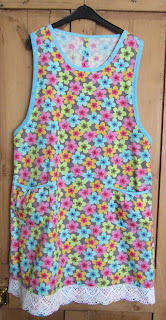 I changed the pattern to sleeveless and lengthened the hem, covering the seams with blue bias binding. 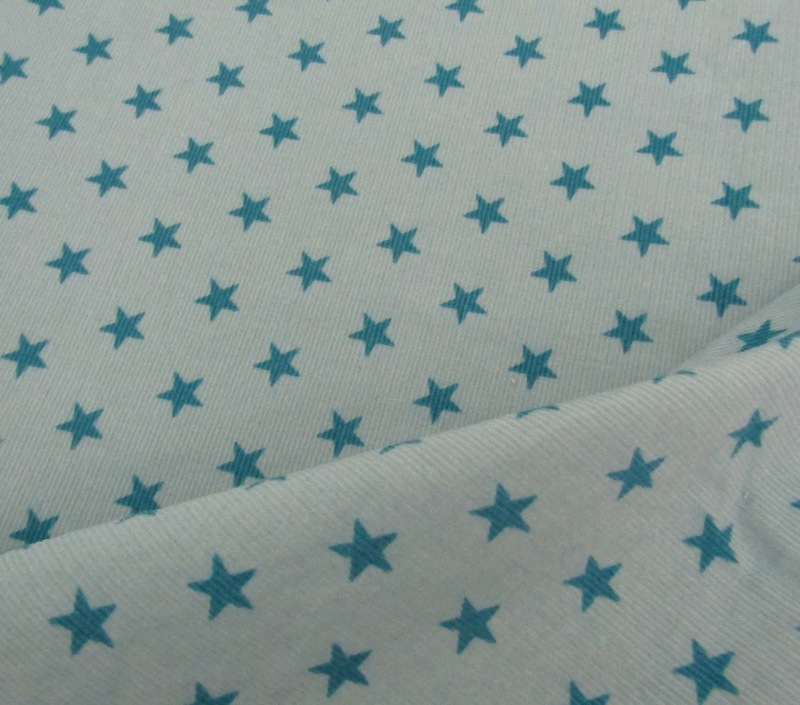 However, it was then too long and I didn't like the bias binding much. As a last attempt, I took off the binding, shortened it a bit, and covered the bottom with cotton lace. Now I am finally happy! 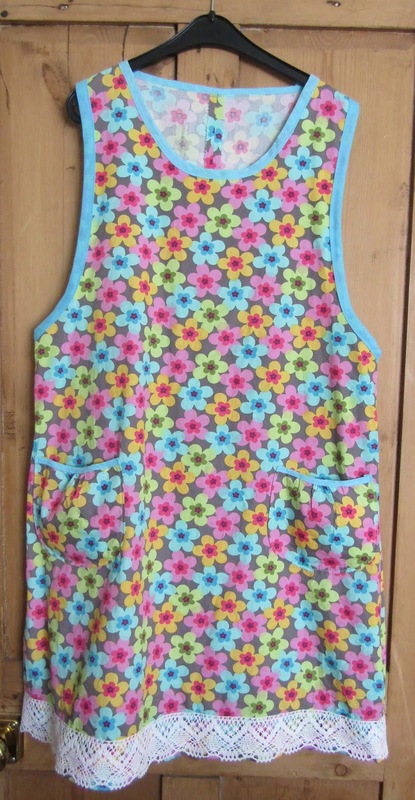 I have also finished my second Cleo pinafore. I stuck to the seam allowances more this time so it is a little slimmer than the first one, but still comfortable and loose to wear. The buttonholes went really well too - no unpicking needed this time! Here's the back. I have worn it once so far. It will be great for Autumn. Here's the material for the next Cleo pinafore (it is a little bluer in real life) and then I would like a denim version. 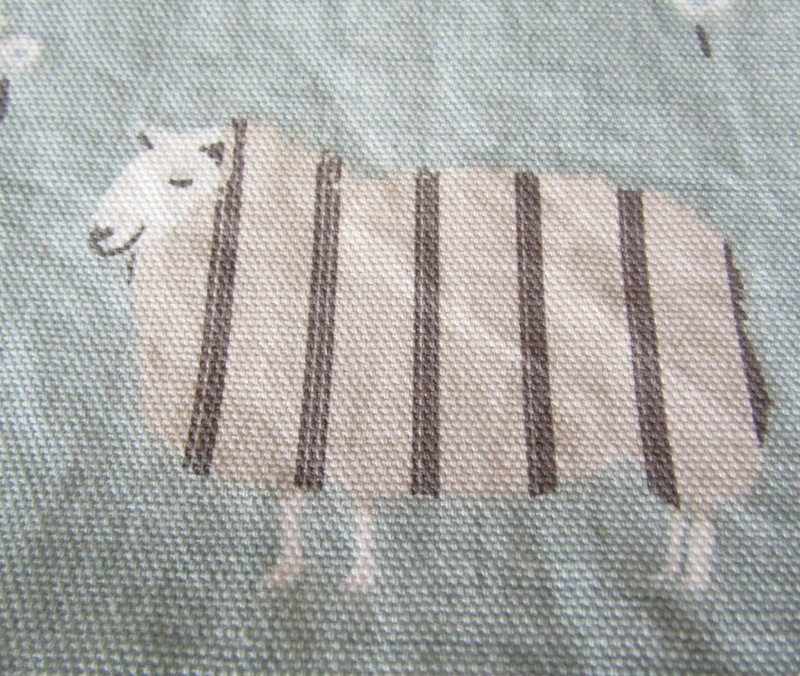 How can you not love a stripy sheep? My next projects are these. Two (hopefully) simple summer tunic dresses. I have had the patterns for a while but have never got around to making them. I will make a toile version first, just to get the hang of the patterns and to adjust the fit - I have narrow shoulders so will probably need to adjust the pattern a bit. 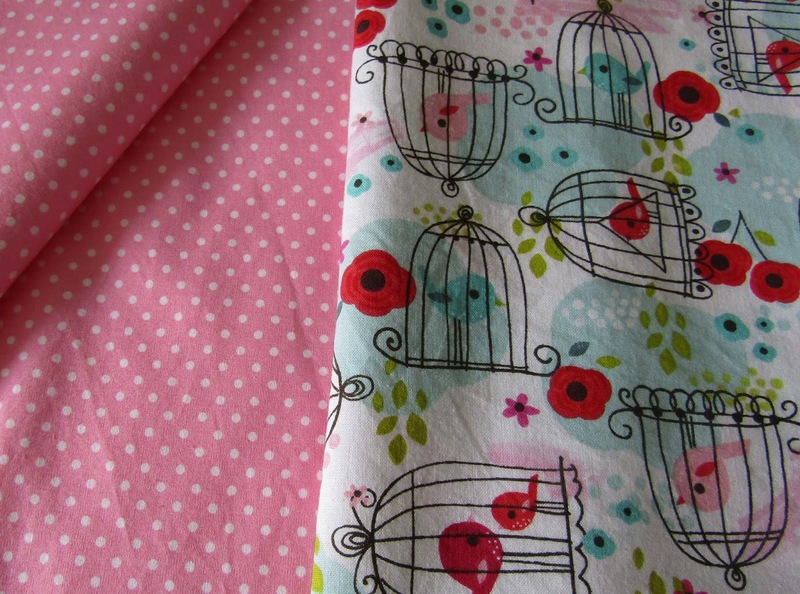 Here are the fabrics for one of them - I really like the cheerful little birds and thought they would look great as a contrast hem or pockets or sleeves (or all three). 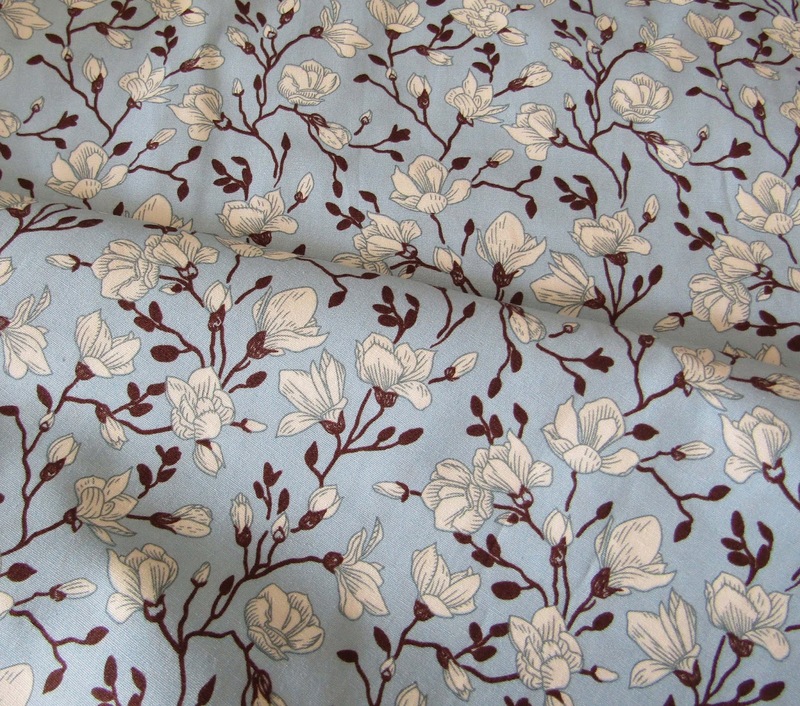 I saw this magnolia fabric and just had to buy it. 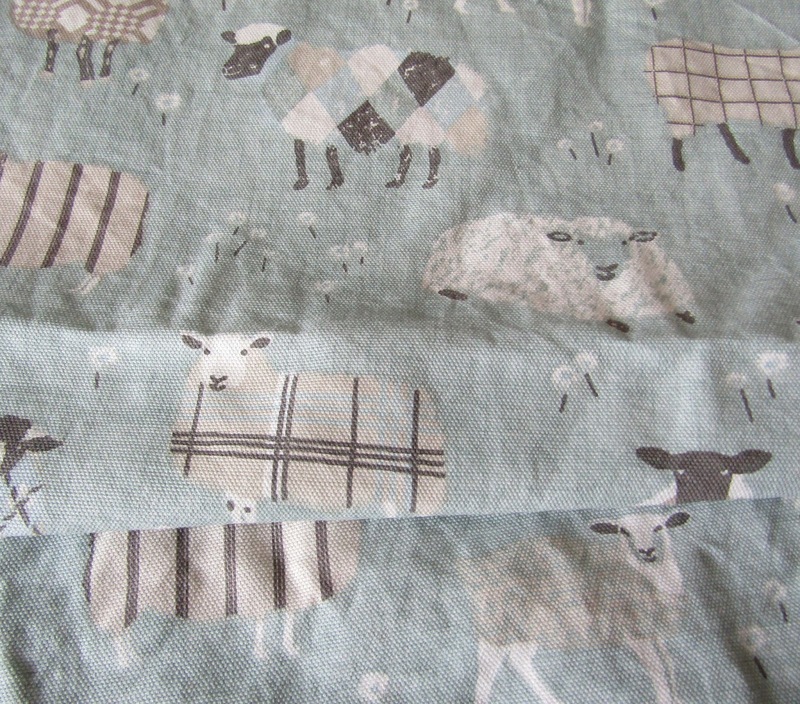 It may be the main fabric or a contrast - I haven't quite decided that yet. 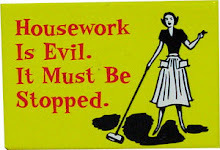 So, plenty to keep me busy and I do need to get on with the summer dresses - I need them for work! 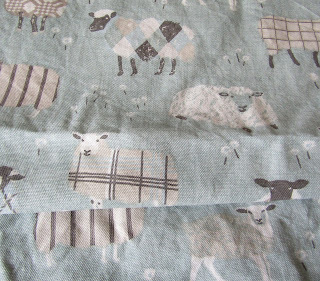 It sounds as if your fabric stash rivals my book stash. Love what you do with it. 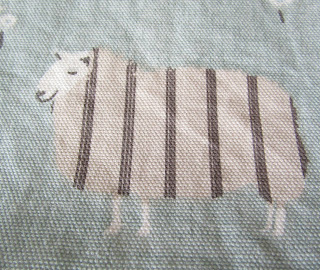 Those stripey sheep make me smile - as cats do. Always. Gorgeous cushion, love the cat fabric! Glad you are happy with your dress now. I always have problems with the clothes I’ve made, have decided now it’s better to buy ready made! 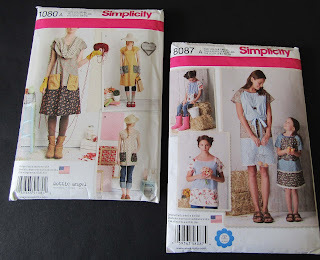 Love the fabric for the second one, and for the Dottie Angel pattern, oh, and the magnolia fabric too! Thanks, Barbara. I am gradually gaining confidence to alter patterns if they don't fit, but I tend to choose the more simple ones in the hope that I can make them. 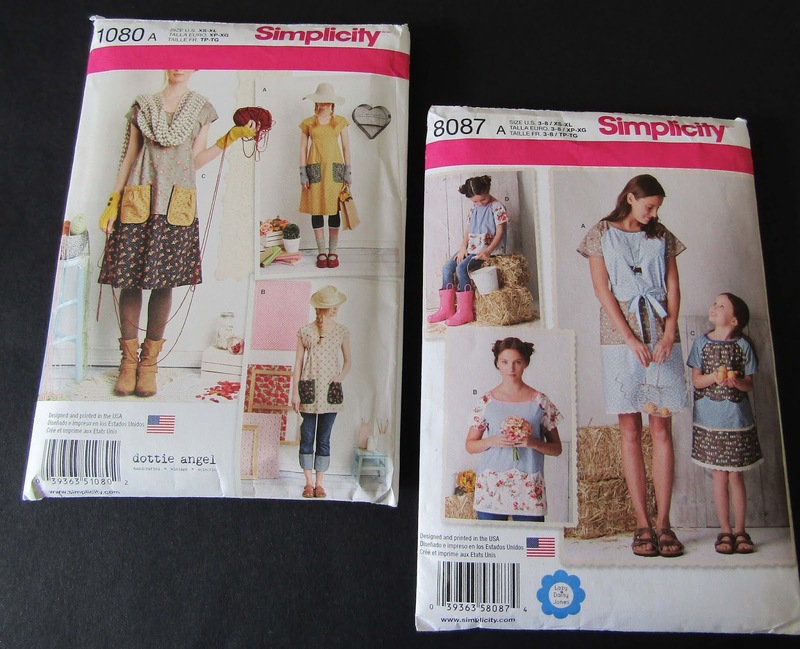 The Cleo pinafore is a lovely pattern and I hope the two dress ones will turn out well eventually. 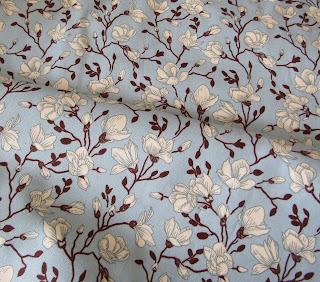 The magnolia fabric is so pretty and was at a reduced price, so how could I refuse? 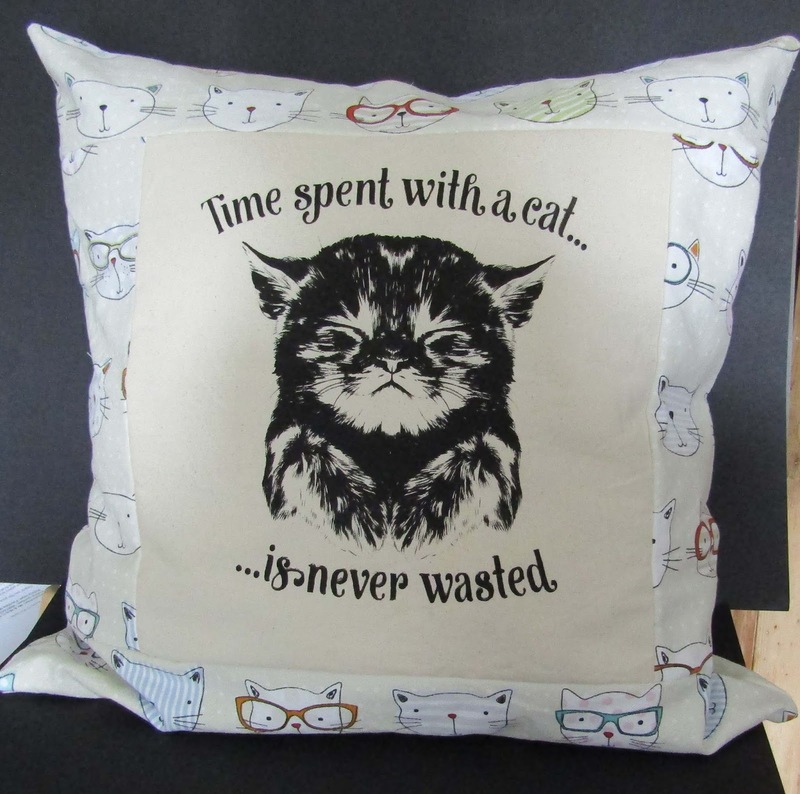 Your cat pillow is adorable!!! Your dress is so cute and looks comfy. Will be anxious to see the pink and bird cage dress, love the two patterns together. Thanks, Chrissie. My project book is rapidly filling up but it is really useful as I don't have to hold all the plans in my head. The summer dresses are next on the list as I need them, but there are always so many other things jostling for attention. One positive is that I am never bored! Me, making my blog rounds again. Hope you've made headway with your projects since my above visit. Don't you hate it when work get's in the way of your plans, lol.